U.S. airmen from the 8th Expeditionary Air Mobility Squadron prepare boxes of halal meals for a humanitarian drop over Iraq in August 2014. A 2016 budget increase in foreign aid includes more support for humanitarian assistance. The massive, year-end spending bill passed by Congress on Friday contains a boost for foreign aid, putting a strong focus on anti-terrorism efforts and addressing instability in the Middle East. It also aims to protect American diplomats and facilities abroad and to provide humanitarian assistance to those in need. Overall spending for State and Foreign Operations in 2016 totals roughly $53 billion – up almost $3.5 billion from the 2015 budget. That money funds the State Department, U.S. Agency for International Development and a number of other international programs, including the Voice of America. Some development professionals say they are happy about the increase, but are concerned about an overreliance on the Overseas Contingency Account (OCO), created to finance the global war on terror. A media platform for the development aid community, Devex, says foreign aid advocates worry that a heavy reliance on OCO money may help in the short term, but may expose their programs to long-term risk when anti-terrorism operations wind down. 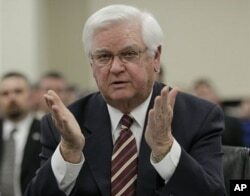 FILE - US Rep. Hal Rogers, R-Kentucky. "base appropriations," the basic pool of funding that has paid for international aid programs for many years. The House Appropriations Committee says the OCO funding is to combat the Islamic State terrorist group and other U.S. enemies. Republican Committee Chair Hal Rogers says the bill exceeds President Barack Obama’s request for embassy security and provides funding to prevent and protect against future terrorist attacks, unrest and other acts of violence. The funding increase for embassy security comes in response to the 2012 attacks on the U.S. consulate in Benghazi, Libya, that resulted in the death of U.S. Ambassador Christopher Stevens and three other Americans. FILE - Ukrainian soldiers learn battle skills such as first aid from U.S. Army troops at the International Peacekeeping and Security Center in western Ukraine. The bill maintains the fiscal year 2015 level for migration and refugee assistance. It specifies that additional funds are available if needed to respond to humanitarian crises overseas, but not for the president’s domestic refugee resettlement program. In addition, $2.8 billion is provided for the International Disaster Assistance program to provide relief to those affected by natural disasters and displaced by conflict in places like Syria and Ukraine. A State Department official told VOA that the department recognizes the difficult trade-offs that Congress made to pass the 2016 funding bill, and that it’s pleased with the overall funding provided for international affairs. In addition to providing funding, the State and Foreign Operations part of the budget legislation also has some policy provisions. It includes a requirement that the State Department report to Congress on agreements with other countries to accept detainees from Guantanamo Bay, Cuba. It also specifies that there be no funding for debt relief for foreign countries.